Martin Shkreli is jailed after soliciting lock of Hillary Clinton's hair. Martin Shkreli after the jury issued a guilty verdict at the U.S. District Court for the Eastern District of New York on Aug. 4 in Brooklyn. Pharma bro fraudster Martin Shkreli was jailed Wednesday after a federal judge revoked his $5 million bail in response to a Facebook post where Shkreli solicited a strand of Hillary Clinton’s hair in return for $5,000. 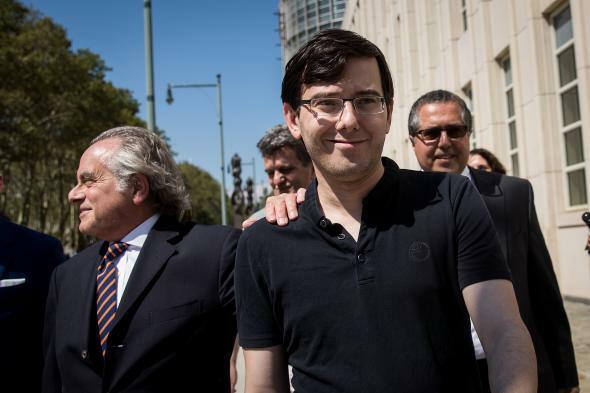 Shkreli was convicted in August on three counts of fraud over his running of two hedge funds and a pharmaceutical company and is awaiting sentencing. He faces up to 20 years in prison. On Facebook, Shkreli has struck a more defiant note. “Lol Hillary Clinton’s presumptive agents are hard at work. It was just a prank, bro! But still, lock HER up. Spend your resources investigating her, not me! !,” he said in a post the same day prosecutors filed their motion to have his bail revoked. Shkreli has indicated he will appeal his August conviction.